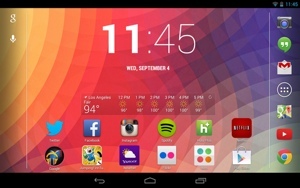 Android 4.3 as it appears on a Nexus 7 tablet. I’ve always been an Apple fanatic. I have owned iPhones exclusively for the last 5 years and never once considered switching to Android. I even own an iPad. After all, my iOS experience has been great – why switch to an unknown? Well, a month or so ago I took Google’s Android-powered Nexus 7 tablet ($229 on Amazon) for a test drive. I expected to dislike the operating system, or at least come away with proof that iOS is definitively better. But after just a month of using Android part-time, I fell in love with the Nexus 7 and the OS behind it. Here’s why. One of my perpetual frustrations with my iPhone and iPad has been the fixed, unchanging weather app icon. Why do I have to enter a separate app to get information that could easily fit in the screen space taken up by the app’s icon? It’s never made sense to me and it never will. With Android, you can have a real-time weather widget right on your home screen in any number of sizes. That way, when my Nexus 7 tells me that it’s 73 degrees and sunny, I know the forecast is for real. And that’s only the beginning – widgets are available that allow you to control Spotify, flip through Google Now cards, check the latest sports scores and more. I had my first Android experience playing around with my mother’s Droid. I didn’t much care for it. The default experience simply wasn’t as intuitive as it was on my iPhone. It seemed like there was learning required, and Android’s wealth of menus and options seemed daunting to learn. And beyond that, it looked ugly. It turns out I was absolutely wrong. I love the design of my Nexus 7’s Android 4.3. It’s totally customizable, though it works great even if you don’t alter a single default setting. It looks great too – just take a look at that screenshot. There's no reason why you can't set up your Android device up exactly like an iOS one, if that's what you'd prefer. 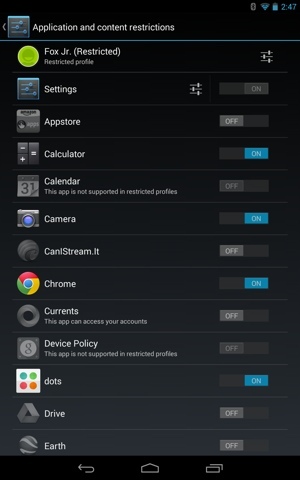 Android 4.3 offers app-by-app parental controls. When I got my first iPhone 5 years ago, the Google Play store didn’t even exist. Apple got a head start in the app game, building an early lead in available titles and downloads that Google couldn’t seem to catch up to. Or, at least, Google couldn’t catch up … until now. Google Play now houses more apps than Apple’s App Store. And according to Forbes, Google leads Apple on total downloads as well. Sure, there are some iPhone applications that Google doesn’t have access to (yet), but the days when major apps like Instagram and Vine were only on iOS are long gone. 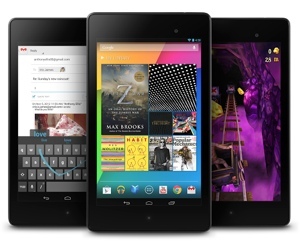 Android 4.3 offers more ways to manage kids’ tablet usage than ever before. You can create different user profiles and approve each individual app that others will have access to. It’s easy to set up – just tap the Users option located in the Settings menu. I use Google services a lot, both on and off my smartphone. It’s my search provider of choice. Google Maps is my default mapping application. I have a Gmail account. And now that I’ve been playing around with a Nexus 7, I’ve gotten roped in to loving the predictive Google Now as well. In my experience, Google products work and they work well. Android simply does a better job integrating them into the core experience. Take that, Apple Maps. See the little house icon at the bottom of the Android screenshots I posted above? That’s the Nexus 7’s home button. It’s virtual. On my iPhone, the home button is a physical thing I have to mechanically depress. It’s a movable part that tends to break, a problem I've experienced personally. With my Nexus 7, that's not a worry. There’s only one place to get apps for my iPhone, and that’s at the Apple App Store. It’s a strictly controlled experience, for better or for worse. There’s a much lower risk of dealing with malware through Apple, but there’s no competition, no other alternative. Apple has a monopoly. With Android, I have my choice of stores. I can use Google Play. Or, if I want to comparison shop, I can use Amazon’s App Store or Facebook’s App Center instead. More competition means better deals, and I do love a good deal. After 5 years of iPhone ownership, the gestures I use to control the device are deeply ingrained. The swipes, the pinches, the long taps – it’s all second nature and not something I wanted to relearn. Thankfully, Android and iOS share most common gestures and commands. Sure, you’ll need to look up an action every now and then – it took me a while to figure out screenshots – but for the most part, you already know how to use an Android phone, even if you’ve never used one before. Not sold on the iOS 7 operating system? If you’ve been thinking about making the switch to Android, there’s been no better time to do it. Take a look at Techlicious’s favorite Android smartphone and make the decision for yourself!